As you know, distributed systems are very likely to suffer from failure. This is a characteristic of their scale. Sometimes we have sufficient redundancy to keep failures transparent. On other occasions, we need to repair or replace failed processors and pick up where we left off before the failure. This process is known as recovery. Needless to say, recovery is a very important component of many real-world systems. Recovery usually involves checkpointing and/or logging. Checkpointing involves periodically saving the state of the process. Logging involves recording the operations that produced the current state, so that they can be repeated, if necessary. Let's assume that one system fails and is restored to a previous state (this is called a rollback). From this point, it will charge forward and repeat those things that it had done between this previous state and the time of the failure. This includes messages that it may have sent to other systems. These repeated messages are known as duplicate messages. It is also the case that after a rollback other systems may have received messages that the revovering system doesn't "remember" sending. These messages are known as orphan messages. The other systems must be able to tolerate the duplicate messages, such as might be the case for idempotent operations, or detect them and discard them. If they are unable to do this, the other systems must also rollback to a prior state. The rollback of more systems might compound the problem, since the rollback may orphan more messages and the progress might cause more duplicates. When the rollback of one system causes another system to rollback, this is known as cascading rollbacks. Eventually the systems will reach a state where they can move forward together. This state is known as a recovery line. After a failure, cooperating systems must rollback to a recovery line. Another problem involves the interaction of the system with the real-world. After a rollback, a system may duplicate output, or request the same input again. This is called studdering. One very, very common technique involves the use of incarnation numbers. Each contiguous period of uptime on a particular system is known as an incarnation of that system. Rebooting a system or restarting a cooperating process results in a new incarnation. These incarnations can be numbered. This number, the incarnation number, can be used to eliminate duplicate messages. It must be kept in stable storage, and incremented for each incarnation. When a system is reincarnated, it sends a message to the cooperating systems informing them of the new incarnation number. The incarnation number is also sent out with all messages. If the incarnation number in the message is less than the expected incarnation number, the message is a duplicate, so it should be discarded. If the incarnation number in the message is greater than the expected incarnation number, the sender is recovering, so block accepting messages, until it informs us about its new incarnation number. If the incarnation number is the same as the expected incarnation number, accept the message. One approach to checkpointing is to have each system periodically record its state. Even if all processors make checkpoints at the same frequency, there is no guarantee that the most recent checkpoints across all systems will be consistent. Among other things, clock drift implies that the checkpoints won't necessarily be made at exactly the same time. If checkpointing is a low-priority background task, it might also be the case that the checkpoints across the systems won't necessarily be consistent, because the systems may have cycles to burn at different times or with a completely different frequency. In the event of a failure, recovery requires finding the recovery lines that restores the system as a whole to the most recent state. This is known as the maximum recovery line. 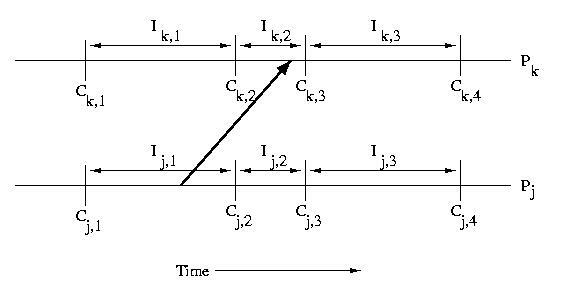 An interval is the period of time between checkpoints. If we number checkpoints, C1, C2, C3, C4, &c., the intervals following each of these checkpoints can be labeled I1, I2, I3, and I4, respectively. it is important to note that the intervals need not be the same length. If we have multiple processors, we can use subscripts such as Ci,c and Ii,c, where i is the processor number and c is the checkpoint sequence number. When a processor receives a message, that message usually causes it to take some action. This implies that the processor that receives a message is dependent on the processor that sent the message. Specifically if a processor receives a message during an interval, it is dependent on the interval on the sender's processor during which the message was sent. This type of dependency can cause cascading rollbacks. If we consider the messages sent among systems we can construct an Interval Dependency Graph (IDG). If any intervals are removed from the graph due to rollbacks or failures, we must remove all intervals that they reference -- this is a transitive operation. The graph is constructed by creating a node for each interval, and then connecting subsequent intervals on the same processor by constructing an edge from a predecessor to its successor. Then an edge is draw from each interval during which one or more messages were received to the interval or intervals during which the message(s) was or were sent. The edge from one interval to its successor on the same processor exists to ensure that we can't develop "holes" in our state -- a hole would imply wasted checkpoints -- those before the hole would be useless. The edge from a receiver to the sender shows the dependency of the sender on the receiver. Remember that the arrow goes the opposite way in the IDG than it did when we showed the message being sent earlier -- this is because the sender is dependent on the receiver, not the other way around. If other actions generate dependencies, they can be represented the same way. Where is this graph stored? Each processor keeps the nodes and edges that are associated with it. How Do We Find The Recovery Line? Very simply. Upon recovery, we tell other processors what checkpoint we'll be installing. Then they rollback to an interval independent of the lost intervals and broadcast a similar message. This continues until the recovery line is established. We can decrease the number of rollbacks necessary to find a recovery line by coordinating checkpoints. We'll discuss two methods for doing this. If messages contain sequence numbers, we can use them to keep track of who has sent us messages since our last checkpoint. Each time we make a checkpoint, we send a message to each processor that has sent us messages since the last time we checkpointed -- we depend on these processors. When these processors receive our message, they check to see if they have checkpointed since the last time they sent us a message. If not, they create a checkpoint, to satisfy our dependency in the event of a failure. Another method for coordinating checkpoints is to take advantage of synchronized clocks, if available. Each processor creates a checkpoint every T units of time. Since even synchronized clocks may have a skew, we assign a sequence number to each checkpoint. This sequence number is sent in all messages. If a processor discovers that the sender has checkpointed more recently, it creates a checkpoint. This checkpoint should be made before passing the message up to the application -- this ensures that we remember the message in the event of a failure, so the sender won't need to rollback and resend.